NEW YORK-- The State of Kuwait Permanent Representative to the United Nations Ambassador Mansour Al-Otaibi announced on Tuesday that Kuwait would present to the United Nations Security Council member states a draft resolution asking for protection of the Palestinian people. Ambassador Al-Otaibi was speaking to journalists ahead of the UNSC session, called by Kuwait to discuss latest development in Gaza. Al-Otaibi affirmed in a previous session that the Palestinian people must not continue to be exempted from international commitments and laws, namely the adherence to protecting civilians from atrocities and grave breaches and Israel, as the de facto occupation entity, must implement the Fourth Geneva Convention of 1949 on safeguarding the civilians. "We strongly support securing international protection for the Palestinian people in the occupied territories and resisting the Israeli occupation repressive practices and policies," he stated. MUSCAT: The Sultanate expressed its solidarity and support for the just rights of the Palestinians to establish their independent state on the borders of June 4, 1967 with Al Quds as its capital. A source at the Foreign Ministry on Tuesday said that the Sultanate calls for a political solution for the existing conflict between Palestinians and Israelis that entails establishing two states that coexist peacefully side by side. 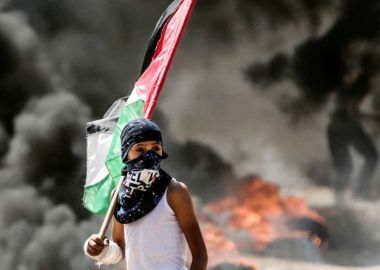 Meanwhile, the chief prosecutor of the International Criminal Court vowed that she was watching closely the unrest in Gaza and would “take any action warranted” to prosecute crimes. “My staff is vigilantly following developments on the ground and recording any alleged crime that could fall within” the tribunal’s jurisdiction, Fatou Bensouda warned in a statement. She recalled on Tuesday that the “situation in Palestine is under preliminary investigation by my office”.